The puppy was treated at Arroyo Veterinary Hospital in Harlingen after being burned earlier this year with cooking oil. 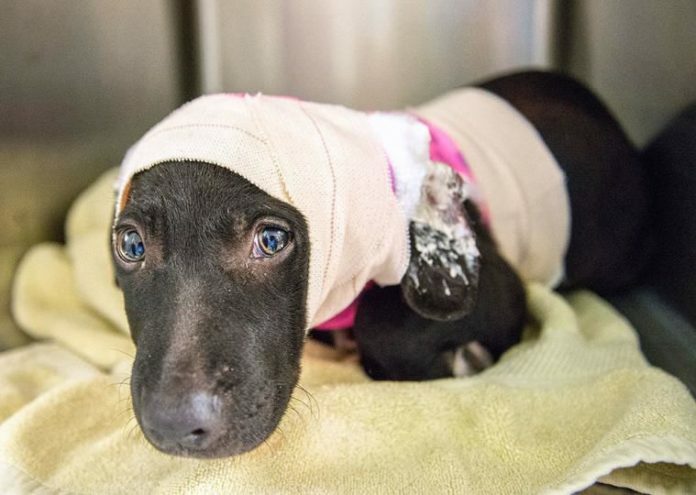 Cameron County District Attorney Luis V. Saenz said Wednesday that no charges would be brought in the case of a puppy that was severely burned last September with cooking oil. “I can tell you that immediately after this case came up and we were in the middle of this investigation, we realized that we had to send the case back because the investigation was rather poorly done,” Saenz said. The investigation was conducted by the Cameron County Sheriff’s Department. That case was resubmitted to the DA’s office in November. The investigation by the DA’s office revealed that the then-2-month-old pit bull’s burns were the result of an unfortunate accident, authorities said. Administrative First Assistant District Attorney Edward A. Sandoval said the man who accidentally burned the puppy routinely dumped the oil that he used to cook food outside of a door adjacent to his kitchen, and on that day, like any other, he didn’t look outside before dumping the oil. “He never saw the dog,” said Sandoval, the lead investigator on the case for the DA’s office. As for the puppy, which survived and was later adopted, it happened to be where the man dumped the used cooking oil. Sandoval described it as simply an unfortunate coincidence. “The guy felt very bad that he hurt this dog.” Sandoval said.